Only one in ten visitors to your site actually clicks your affiliate link. 30% of sales are lost due to thieves stealing your commission right under your nose by changing your affiliate link to their own. Most visitors resent the fact that you are making a commission from their sale. Hexadecimal encoding is not secure! "A must have tool for any affiliate marketer. I love the Covert Affiliate Download Trial that they offer"
"Until I came to know about Covert affiliate, I had never thought about the amount of sales I had lost"
"Most affiliate marketers aren't even aware that their commissions are being stolen from under their noses by thieves"
"This one tool is a must have for every marketing online. Novasoft has given me a simple easy to use tool that has saved me a lot of money in terms of recovered affiliate commissions"
"Now You Can Earn Affiliate Commissions From Even Those Folks Who Don't Click Your Affiliate Link!" "Profit from this little known secret software that top affiliate marketers have been using to gain an "unfair" advantage over thousands of others like yourself..."
"In fact, Covert Affiliate™ is so subtle visitors won't even know they have been cookied! Covert Affiliate not only hides your affiliate link code, but it encrypts it. It also adds security to the web page so folks can't view the source code and edit to replace your affiliate ID with their own." "This is a sophisticated tool worthy of your attention. " FACT: Affiliate marketing is a difficult business! Even though the experts recommend it as one of the quickest ways for even a newbie internet marketer to make money online, the sad truth is - it's a cut-throat business that not many people are really successful at. As affiliate marketers, we put a lot of time, money and effort into our promotions and websites - only to be disappointed by low sales. From Every Visitor To Your Site, Guaranteed!" Sound too good to be true? Well it's the Truth... So read on. Many visitors to your web site will read about the affiliate products you promote, but will not click your affiliate link to go to the sales site. Perhaps there's someone at the door, maybe the phone rings, the baby's crying. Who knows? When they do eventually decide to buy the product, they only remember the name of the product, so most will simply search the product on a search engine and visit the site directly. A lot of people just hate the idea of someone making a commission from their purchases. And this is the sad truth --- most folks hate to buy from an affiliate link! It's an ugly little secret. But even people who themselves are affiliates, will do everything they can to avoid buying from a hard-working affiliate. So, they simply bypass your affiliate link and visit the site directly. Even though they found out about the product due to your hard work, you never got the commission for it! Thieves who steal your rightful commissions quietly, completely without your knowledge! where your affiliate id is passed as a parameter. A thief has to simply change the "YOUR-ID" part to "HIS-ID" and he buys the product at a discount and you've lost your commission. Now is that FRUSTRATING or what?! what's rightfully yours... what you've spent your sweat, time and money on! No way, José! You deserve every red cent! - and adds a little bit of code to your existing web page (when you use the "embedded mode"). BAM! - they get tagged with YOUR affiliate cookie. ...and gives the visitor a cookie without his knowledge. your visitor will NEVER EVEN KNOW he's been "cookied". 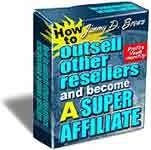 Covert Affiliate™ is NOT a simple link cloaker! It's a VERY sophisticated affiliate tool ! "I'm very serious about the money I make from affiliate programs. There are several software applications I wouldn't be without in my endeavor to make a ton of money in affiliate marketing. One of those programs is Covert Affiliate. People hate buying from affiliates. They'll either steal your commission by changing your affiliate ID to their own or they will delete your affiliate ID completely so you don't get the commission. Covert Affiliate eliminates those problems immediately. This fantastic software both cloaks the URL, hiding your affiliate information, and it gives the visitor a cookie without his knowledge. So if he buys, you get the commission. And that's the way it should be. The buyer won't even know he's buying from an affiliate! The program is easy to use. What's more, customer service at Novasoft is just fantastic! Satya cares deeply about creating the best quality software possible. I highly recommend Covert Affiliate. I don't see how you can be successful in affiliate marketing without it.."
Susanna Hutcheson is a Copywriter and marketing consultant with more than 30 years of copywriting experience in business-to-business and business-to-consumer direct marketing. She is also a highly successful affiliate marketer. Do you write excellent reviews of products, but aren't getting too many people to click on your affiliate links? That's not surprising, since people are much less likely to click on an affiliate link than on a direct link to a sales page. Also, when you use an affiliate link, your review will be viewed as nothing more than a thinly-veiled sales letter. Now, instead of using your affiliate link, you can disguise your web page as an "unbiased" review of the product, or of multiple products, using the "embedded mode" of Covert Affiliate. So now, you can write your reviews and articles, secure in the knowledge that your visitor will never even realise that you're an affiliate for the product. and more likely to click the "buy" button! You'll learn exactly how to put this into action in the The "Unfair" Affiliate Advantage Email Course. Have you ever had the misfortune of having to sell a prospect on a fantastic product and then send them to a page with multiple products - all vying for their attention? Like where a Clickbank merchant has ONE home page featuring many products, and you only get one affiliate link that sends your visitors to the home page. Most visitors get frustrated being redirected to a page with a dozen products on it and never take the effort to find the particular product you referred. Or else they get distracted, starts browsing and forget which product they came to check out. With Covert Affiliate™, you can send your visitors to the exact product page. In fact, you can send your visitors to the direct product page, the order page. - and still tag them with your affiliate ID! Combine Covert Affiliate with one of the most effective and powerful tools of generating targeted traffic - Google Adwords! Anyone who has used Google Adwords knows that it does not allow you to use a web page with popups as your destination page. In fact they will even suspend your account if you send prospects to a page with popups. So let's say you want to use the highly targeted traffic from Google Adwords to sell an affiliate product. And you can't send your prospects directly to the product sales page - even if it converts very well - because it uses popups (let's face it, most sales pages do). But you CAN send them to a page generated by Covert Affiliate. take your affiliate business into the BIG league! More Residual Income in the Bank! As an affiliate marketer you probably understand the value of two-tier and multi-tier affiliate programs - especially those with the potential of monthly residual income. Let's say, for example, that you're promoting a product that offers a great multi-tier affiliate program, but that the affiliate program requires you to use a different URL to promote the product and another one to promote the program. Now how do you make sure that another affiliate marketer who comes across it doesn't bypass your ID and signup for it without giving you credit? Or that they leave your website, read a review on another website and signup under that person? With Covert Affiliate, its easy. All you have to do is use the "Embedded Mode" TWICE on the same page - the first time to embed the code for the product URL and the second time to embed the code for the affiliate program URL. both - the product and the affiliate program! And if even one of your visitors turns out to be a "super-affiliate," that's more residual income in the bank for you!! The "Unfair" Affiliate Advantage Email Course will give you examples of some merchants that offer excellent products as well as two-tier and multi-tier affilite programs. There's been a lot of outcry over one big time affiliate program's links recently - and rightly so. This Affiliate network now uses a new system that makes any links added in frames (like most cloakers do) open out into the topmost window. Your visitor knows it's an affiliate link! So you're back where you started - in the big, bad world of affiliate thieves and reluctant buyers. link "cloakers" can no longer claim to do. Note: The code only works on files uploaded on the web server. If you run the files locally they may not work properly. 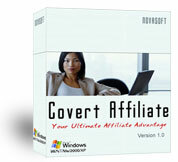 Which Affiliate programs can you use Covert Affiliate™ with? Covert Affiliate™ can be used with almost any affiliate program of your choice with the exception of only Commission Junction® and Clickbank®, who do not permit covert clicks and deem such clicks against their user policy. But hey, its a dog eat dog world.. so if you want to stay ahead of the pack.. There are thousands of high paying affiliate programs on the internet where you can use Covert Affiliate™ to earn huge commissions with almost no effort. EXPLODING Your Affiliate Commissions now! The "CB Search Script" enables you to easily set up a full ClickBank® shopping portal, through which you can offer access to over 11,000 products and services - and earn up to 50% commission for every sale generated! Clickbank® is the registered trademark owned by Keynetics Inc and Novasoft Inc is not not affiliated with or sponsored by Keynetics Inc.
Commission Junction® is the registered trademark owned by Commission Junction Inc and Novasoft Inc is not not affiliated with or sponsored by Commission Junction Inc.